A 5.8-magnitude earthquake struck southern Italy this afternoon while rescuers were working to remove the last of the victims, mostly children, from a collapsed school in the village of San Giuliano di Puglia that fell after a 5.9-magnitude earthquake hit the region yesterday morning. The final death toll at the school included one teacher and 26 children. Two women also died in nearby homes destroyed in the earthquake yesterday. More than 325 rescue workers responded, but those attempting to reach the school had to detour around a damaged bridge, according to reports. Rescuers saved 35 children from the rubble in the 24 hours following the collapse. Today's quake sent parents and residents to the streets again in fear, but no deaths were immediately reported. The earthquake struck at 15:09 UTC or 4 p.m. local time along the same fault as yesterday's major earthquake and two 3.6- and 3.7-magnitude aftershocks. 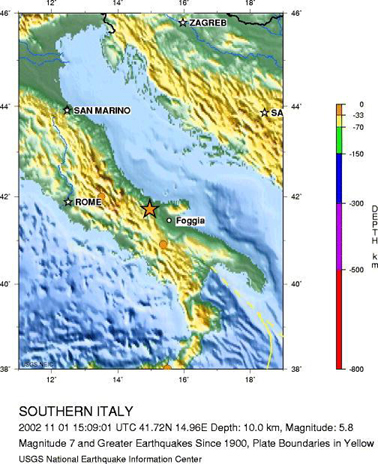 The epicenter of the earthquakes have been within 5 kilometers of each other in a region due east of Rome near Italy's Adriatic coast. All have occured at about 10 kilometer depths on a strike-slip fault. The earthquakes are unrelated to the volcanic eruptions and associate earthquake swarms occuring beneath Mount Etna on the island of Sicily, several hundreds of kilometers to the south. The good news is that the lava flows from Mount Etna are slowing after a week of intensive activity on the volcano. What began with a swarm of minor earthquakes and a series of erupting fissures in the pre-dawn of Sunday, Oct. 27, culminated Tuesday with a 4.4-magnitude earthquake that left thousands homeless in the town of Santa Venerina on the volcano's southeast flank. Lava flows estimated to be 365 meters wide and 6 meters thick cut across the road connecting the towns of Linguaglossa and Piano Provenzana igniting several forest fires along the way. 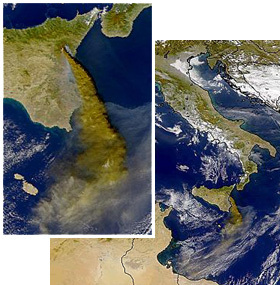 A satellite image of the Mediterranean on Oct. 28 shows an ash plume from Mt. Etna. Image provided by the SeaWiFS Project, NASA/Goddard Space Flight Center, and ORBIMAGE. Although ash continues to flow from the fissures, the wind direction has shifted and, after a five-day closure, Catania's airport reopened with workers sweeping truckloads of ash from the runway.